The first thing is to create your heart. I want a nice smooth shape that is basic black and white. You could use some clip art, but I really prefer to make my own “clip art”. (pun intended) With my own art, I never have to worry about using a copyrighted image or inadvertently stealing someone else’s design. I could draw something in Illustrator or use the vector tools in Photoshop, but I think it is so much easier to just start with a piece of paper. Seriously. Why? I like the quality of the shape. Vector designs often look too perfect to me. It is really fast and easy to use the circle tool and the pen tool to create something that is symmetrical and has perfectly smooth lines, but I think that’s boring. It is also fast and easy to use scissors and a piece of dark colored paper to cut out a shape, and get all kinds of imperfections: little wobbles of the scissors, curves that are more irregular and so on. It looks less computer generated to me and I like that. When you live in Minnesota, “Back-to-School Season” is quickly followed by “Snowboots Season”. When I asked my sister what she thought would be a great back-to-school project to share with the Spoonflower Back to School Blog Hop, she described a “stuff sack” type bag to put the kids’ shoes in their backpacks when they have to wear their snowboots to school. Something to keep the papers from getting dirty and books from getting crumpled by dirty sneakers. With each kid needing regular shoes, gym shoes and snowboots, there are a lot of shoes getting hauled back and forth on the bus every day. My niece and nephew are 7 & almost 9 years old and I thought the bags would be the most fun (and more likely to get used) if I could get the kids to help me with the fabric design. What better for a shoe bag than a fabric print with shoes? So I drew a coloring book page with a canvas sneaker. I drew it in fine tip sharpie, scanned it and emailed it to my sister. She printed copies and let the kids color the shoes any way they liked. They chose colored pencils for these, but this would also work with markers, crayons, or watercolor. Download: If you want to make your own shoe print, you can download my shoe coloring book page here. It is yours to use any way you like. I love goldfish. My logo has been a goldfish for years and years. (His name is Smee.) I have 2 goldfish named Harold and Henry that spend their summers outside in the waterlily pond and the winters in my living room begging for someone to feed them. So goldfish might not seem like an obvious ornament choice, but I love ornaments that are a little whimsical. 1. Right-click or option-click the pattern pieces below and save them to your computer. Then you can print them out. Cut two bowls (circles) from the blue felt. Set one aside. 2. With the embroidery needle and a piece of green embroidery thread, use a feather stitch to embroider a plant in the fishbowl. Here’s a great feather stitch tutorial. 3. Use the beads to add a pebble bottom to your fish bowl. With a beading needle and thread, stitch individual beads in a random scatter. Be sure to keep your beads about 1/4 inch from the outside edge of the bowl. 1. Using the rotary cutter and ruler, cut the felt in to strips 1/2 inch wide by 12 inches long. You will need 2 strips of felt for each candy. 2. Choose two different colored strips. Layer one strip on top of the second, matching the long edges. Starting at one short edge, roll up the two strips. You will now have a disk with a two-colored spiral. This is your candy. 3. Stitch the short ends of the felt to the roll with a couple of small stitches to hold them in place. 4. Cut a rectangle of tulle about 4 by 8 inches. It should be wide enough to wrap around your candy with a little overlap. This will be the wrapper. 5. Wrap the candy in the tulle wrapper. Cut two pieces of embroidery floss or ribbon. Use a square knot to tie the ends of the wrapper on each side. 6. Trim the ends of the wrapper so they are even. 7. Thread a piece of embroidery thread in your needle. Stitch through the candy and then back again to the other side. Remove the needle and tie the ends of the thread together to make a hanging loop. A note about the sequins I used: I found snowflake shaped sequins in the scrapbooking section at the craft store and I think they were really perfect on this snow bear. You can also find squares, stars and other shapes. 1. Right-click or option-click the bear pattern below and save it to your computer. Then print it out. Using the pattern, cut out one bear from white felt. 2. Thread your beading needle with a piece of regular sewing thread. Tie a knot in the end. Poke the needle through from back to front, where you would like one sequin to be. 3. Thread a sequin, then a seed bead on to the needle. Stitch back through the hole in the sequin, back through the fabric and pull the thread snug. The bead will hold the sequin in place. Cover the bear shape with as many or as few sequins as you like. I made these little deer ornaments originally as gifts for my co-workers one year. A friend took one look at the goggle-eyed deer and said “That’s what deer in the headlights look like.” The name stuck. 1. Right-click or option-click on the deer pattern piece to save the pattern piece below to your computer. Then print it out. Trace the deer pattern on to the paper backed fusible webbing. Following the instructions on the packaging, iron it to fuse it on to the back of your scrap fabric. 2. Cut out your deer. 3. 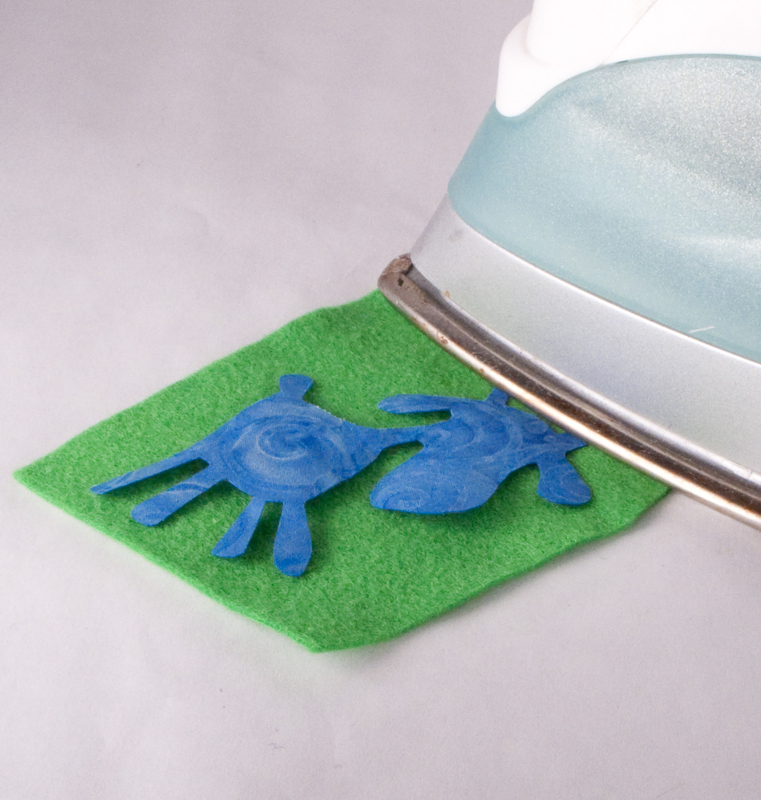 Peel off the paper backing from the felt deer and place the deer, glue side down, on to a piece of felt. Iron to fuse it in place. Note: If you are using acrylic felt rather than wool felt, please test a scrap first to make sure it doesn’t melt when you iron it. 4. Cut out around your deer again, leaving about 1/8 inch border of felt all the way around.